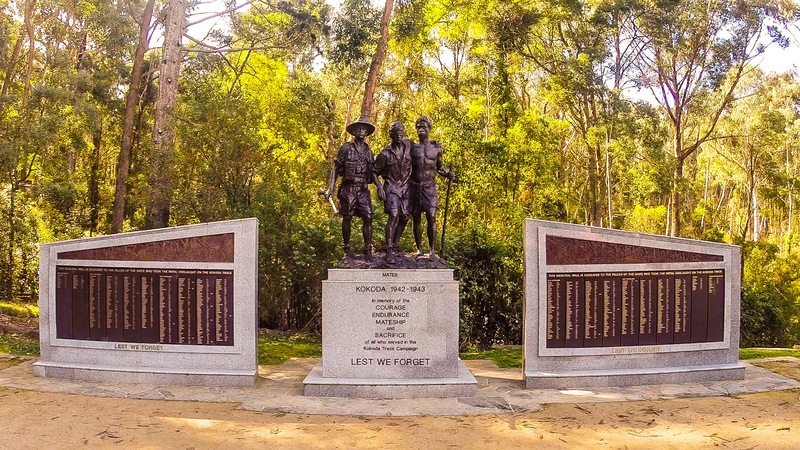 To commemorate the 100 year anniversary of the brave Australian and New Zealand Army Corps landing in Gallipoli, I decided that in my way to honour the many lives lost during that terrible ordeal and the many wars and battles since I would walk the 1000 steps Kokoda memorial walk. Accompanying me on my MicroAdventure this month was my beautiful Fiancé and my father. We drove out to the Dandenong Ranges, which is just under an hour to get to from the city centre via the Eastlink toll road. 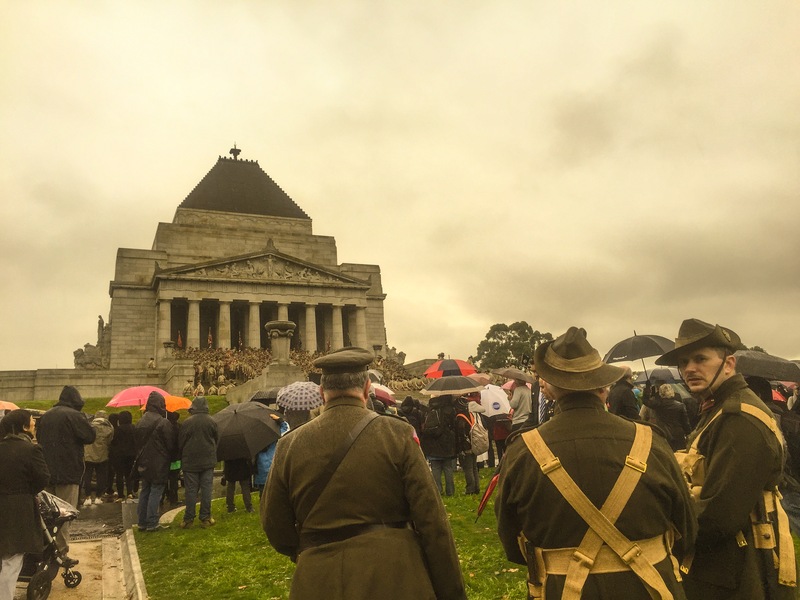 The cool, fresh feeling morning was the ideal temperature for the Kokoda ascent. Had I realized prior to arriving, that there were a substantial amount of facilities available for Picnics and Barbecuing I would have brought some food for afterwards. Starting alongside the many other walkers, tourists and local fitness enthusiasts up the concrete steps. At first I was surprised at the intensity of the steps and also that it appeared to be laid out next to a dirt track. My vision of walking through close quartered steps through bush terrain was out the window. Nevertheless, we were here and I came to explore, so I went with the flow. The incline was fairly tiring and made me realize how unfit I am. “This is nothing like it looks online.”I said in between breaths. Then a woman just ahead of us turned around. “Are you here for the Kokoda 1000 steps?” She asked. “Yes, is this not the steps?” I answered. “Oh ok, thanks for that.” I said. We decided to walk to the top on this track and down the 1000 steps on the way back. A part of me wanted to start again, but the rest of my body said no frigging way dude! Don’t get me wrong the track we were walking was still amazing to look at. The surroundings were spectacular native bush land, and with the morning dew still lingering in the air it was a pleasant change to inhaling the pollution from the city. The walk had only taken under half an hour so we spent some time looking around. The track we were on continued, it was tempting to see how far it went but I came to walk the 1000 steps and had already failed at walking up them. Walking down the steps having not experienced them on the journey up to me felt like a much greater way to enjoy them and truly take it all in. We were able to stop and enjoy the scenery more. As the steps are quite narrow if you were to stop on the walk up people would need to go around you. 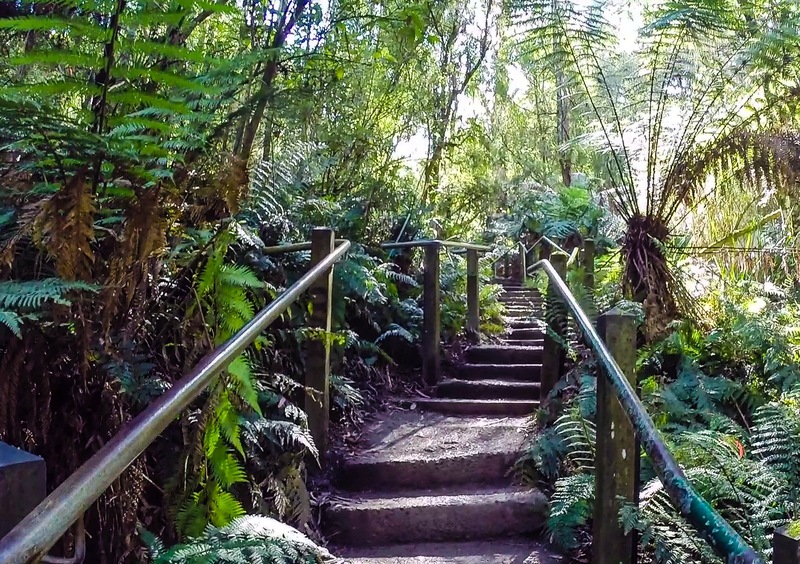 The steps were designed to feel a little like the soldiers endured during their horrendous ordeal at Kokoda, but honestly I think this was but an insignificant percentage of what they had to go through. For one we weren’t carrying large packs full of supplies and weapons. It was not overbearingly humid and we weren’t being attacked by Japanese soldiers known for their fearsome kamikaze fighting tactics. After speaking with a few of the locals that walk these tracks often, I was surprised to find that many of them were convinced the track we walked on the way up was significantly more difficult than the steps themselves. Once we finished our walk my Fiancée and I headed to the Mornington Peninsula. Around an hour drive from the Dandenong Ranges by car. We were booked in for Tree Surfing at the Enchanted Adventure Park in Arthur’s Seat. The drive went quick and with it being the middle of the Easter weekend there was hardly a car in sight. We drove up and up on the switchback roads to the destination and I was quietly excited at all the childish activities available. 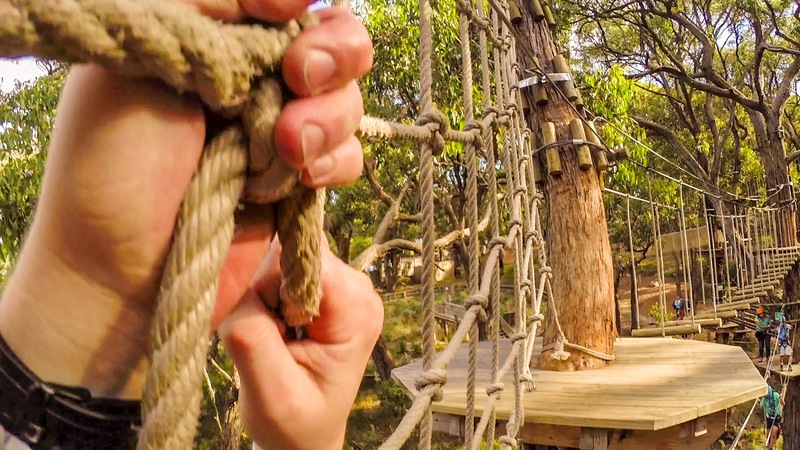 The Enchanted Maze, the huge zip lines over the lake, and so much more. I wanted to try everything but we were short on time as we had half an hour before our Tree Surfing began. We decided it would be unwise to go in the maze just in case we never made it out. The tube slide is fairly self-explanatory; you are given a large donut shaped tube and ride down a long, water lubricated slide to the bottom. It looked like fun and the line was not that long. Three families with misbehaved children managed to cut in and thirty minutes later we finally were given our donut tubes and sent up the top. It hardly felt worth it by then but I had invested too much time and frustration into this endeavor I wasn’t going to back out now. So we got to the top, watched the people who cut in prepare to go down, the staff member gave them a kick and down they went. I sat in the donut, ready and waiting; I had my GoPro camera with me and set it to record. Kick! Down I went, the spray from the water was refreshing and faster I went down the slide spinning uncontrollably until five seconds later I was at the bottom, already! Whilst on the slide it was enjoyable, I still have yet to decide if it outweighed the previous thirty minutes. There was no time to reminisce; we needed to be at the meeting point for our Tree Surfing demonstration. So we power walked back, were given a helmet and harness and sent across with our group to the climbing area. What an area it was, it was like something from the set of Hook, which must have made me Robin Williams. I was going to be flying across this two hour course in no time. I wouldn’t have been surprised if they carved one of the trees in my image as a record of my super flying skills. We were shown how to use our carabineers and pulleys from each course to the next, and thus ended our pre course demonstration. The course consists of five separate skill levels. No#1 being easiest and No#5 being hardest. As there were a large number already on No#1 the instructor sent us up course No#2. I ran up the steps, clipped onto the first obstacle and stepped on the wooden board being suspended by cables. “It’s a lot more unstable than it looks!” I said to whoever was in earshot. Then the next, and before I knew it my brain and body were back in sync again. 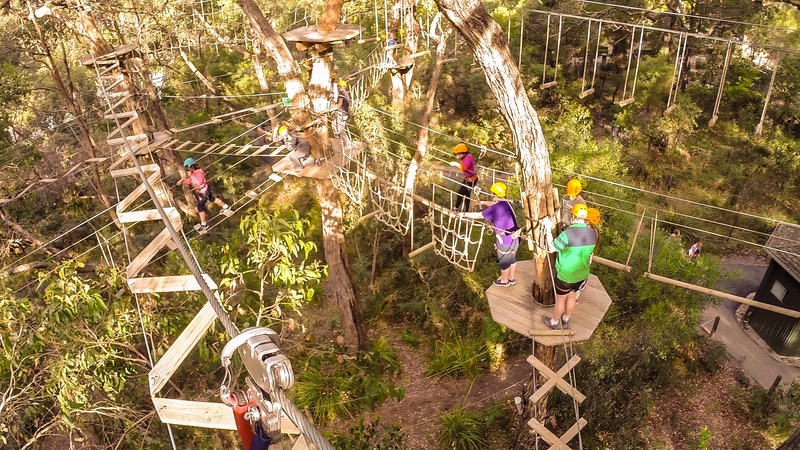 I was stepping and hopping across planks and cables until the end of the course which each one ends in a flying fox on to a pit of tan bark. My fiancé was behind me the whole way and did a great job, despite her fear of heights. Course No#3 was taken up a notch, with one obstacle lacking anything to step on. One needed to get across via a rope net, which relied mainly on upper body strength. My blind optimism kicked in and I leapt. I had visions of myself Spider-Man-ing my way across. I flailed around like a dolphin stuck in fishing net. My arms had become tangled and one of my legs went through it. I didn’t want to give in and rely of my harness but my arms were burning from trying to hold on. They were going two at a time and trying to go while myself or my fiancé were on. I assume I must have embarrassed the father in front of his son as I was given the nickname Mr. Grumpy for the remainder of the day. He said it under his breath or when he thought I wouldn’t hear him, but he failed to realize my awesome super hearing skills. I chose not to retaliate as it would benefit no one. One of the last tasks on obstacle No#5 was the leap. Quite a significant leap off the edge of a high tree and I was left hoping the rope would hold as I waited for it to grab and swing me into another rope net. See the video below of my fiancée taking the leap. Unfortunately there is no video of myself jumping into the abyss as just before I jumped the battery died. Note to self: be more battery conscious! It was getting dark by the time we left Tree Surfing, I managed to get this great shot of the sun setting over the water. Thanks to all the brave men and women who sacrificed so much for our country. For the month of May I have decided to go on some of the many nature walks Mount Buffalo has to offer. With 90 km worth of walking tacks I am sure I will be spoilt for choice. 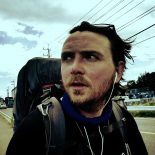 This entry was posted on April 27, 2015 by Robb Saunders in Adventure, adventuretravel, ANZAC, australia, challenge, Climbing, exercise, fitness, Flying, Microadventure, Nomad, Travel, victoria, Video, Walking and tagged Adventure, amazing adventures, kokoda, Photo, Travel, Video, Walking.